A simple, reproducible, and versatile approach for the synthesis of intergrown, polycrystalline metal-organic framework membranes on a wide range of unmodified porous and non-porous supports is presented. He, G., Babu, D. J., Agrawal, K. V. Electrophoretic Crystallization of Ultrathin High-performance Metal-organic Framework Membranes. J. Vis. Exp. (138), e58301, doi:10.3791/58301 (2018). We report the synthesis of thin, highly intergrown, polycrystalline metal-organic framework (MOF) membranes on a wide range of unmodified porous and non-porous supports (polymer, ceramic, metal, carbon, and graphene). We developed a novel crystallization technique, which is termed the ENACT approach: the electrophoretic nuclei assembly for the crystallization of highly intergrown thin films (ENACT). This approach allows for a high density of heterogeneous nucleation of MOFs on a chosen substrate via the electrophoretic deposition (EPD) directly from the precursor sol. The growth of well-packed MOF nuclei leads to a highly intergrown polycrystalline MOF film. We show that this simple approach can be used for the synthesis of thin, intergrown zeolite imidazole framework (ZIF)-7 and ZIF-8 films. The resulting 500 nm-thick ZIF-8 membranes show a considerably high H2 permeance (8.3 x 10-6 mol m-2 s-1 Pa-1) and ideal gas selectivities (7.3 for H2/CO2, 15.5 for H2/N2, 16.2 for H2/CH4, and 2655 for H2/C3H8). An attractive performance for C3H6/C3H8 separation is also achieved (a C3H6 permeance of 9.9 x 10-8 mol m-2 s-1 Pa-1 and a C3H6/C3H8 ideal selectivity of 31.6 at 25 °C). Overall, the ENACT process, owing to its simplicity, can be extended to synthesize intergrown thin films of a wide range of nanoporous crystalline materials. Thin molecular sieving membranes offer a high-energy efficiency in the separation of molecules and can reduce the overall cost of fuels, CO2 capture, water purification, solvent recovery, etc.1,2. MOFs are a promising class of material for the synthesis of molecular sieving membranes because of the involved isoreticular synthetic chemistry and relatively straightforward crystallization3. To date, MOF membranes comprising of diverse crystalline structures, including that of ZIF-4, -7, -8, -9, -11, -67, -90, and -93, and UiO-66, HKUST-1, and MIL-53 have been reported4,5. These membranes are synthesized by crystallizing high-quality polycrystalline MOF films on a porous support. Generally, to obtain a high separation selectivity, it is necessary to reduce the defects in the polycrystalline MOF film (such as pinholes and grain-boundary defects). A convenient approach to reduce the defects is to crystallize a thick film. Not surprisingly, several of the earlier reported on MOF membranes are extremely thick (over 5 µm). Unfortunately, thick films lead to a long diffusion path, which limits the membrane permeance. Therefore, while selectivity is improved, permeance is sacrificed. To circumvent this trade-off, it is imperative to develop methods to crystallize ultrathin (< 0.5 µm-thick), defect-free MOF films. ZIF-8 is the most intensively studied MOF for membrane synthesis, due to its exceptional chemical and thermal stability and a simple crystallization chemistry6,7. So far, the reported ultrathin ZIF-8 membranes have been realized by changing the surface chemistry or topology of the underlying porous substrate, favoring the heterogeneous nucleation of ZIF-8, which is essential for an intergrown polycrystalline film. For instance, Chen et al. reported the synthesis of 1 µm-thick ZIF-8 film on (3-aminopropyl)triethoxysilane-modified TiO2-coated poly(vinylidene fluoride) (PVDF) hollow fibres8. They observed a high heterogeneous nucleation density and attributed it to the simultaneous modification of the surface chemistry and nanostructure. The Peinemann group reported an ultrathin ZIF-8 membrane on a metal-chelating, polythiosemicarbazide (PTSC) support9. This unique metal-chelating capability of PTSC led to the binding of zinc ions, promoting the heterogeneous nucleation of ZIF-8 which, subsequently, led to high-performance ZIF-8 membranes. In general, tuning the substrate chemistry and nanostructure facilitates the synthesis of high-performance MOF membranes; however, these methods are quite complex, and usually cannot be reapplied to synthesize MOF membranes from other attractive MOF structures. Herein, we report the synthesis of ultrathin, highly intergrown ZIF-8 films using a simple and versatile crystallization approach that can be reapplied to form a thin intergrown film of several crystalline materials10. We show examples of ZIF-8 and ZIF-7 films prepared without any substrate pretreatment, which greatly simplifies the preparation process. The ZIF-8 films are prepared on a wide range of substrates (ceramic, polymer, metal, carbon, and graphene). The 500 nm-thick ZIF-8 film on an anodic aluminum oxide (AAO) support displays an attractive separation performance. A high H2 permeance of 8.3 x 10-6 mol m-2 s-1 Pa-1 and attractive ideal selectivities of 7.3 (H2/CO2), 15.5 (H2/N2), 16.2 (H2/CH4), and 2655 (H2/C3H8) are achieved. The crystallization approach that enables the above-mentioned feat is ENACT. ENACT deposits ZIF-8 nuclei onto a substrate directly from the crystal's precursor sol. The approach utilizes EPD for a very short period of time (1 - 4 min) right after the induction time (the time when the nuclei appear in the precursor sol). The application of an electric field to the charged MOF nuclei drives them toward an electrode with a flux that is proportional to the strength of the applied electric field (E), the electrophoretic mobility of the colloid (μ), and the concentration of nuclei (Cn) as shown in the Equations 1 and 2.
η = the viscosity of the precursor sol. Therefore, by controlling E and the solution pH (which determines ζ ), the packing density of nuclei can be controlled. The subsequent growth of the densely-packed nuclei in the precursor sol allows researchers to obtain a highly intergrown polycrystalline film. CAUTION: Read carefully the material safety data sheets (MSDS) of the chemicals involved. Some of the chemicals used in the experiment are toxic. The present method involves the synthesis of nanoparticles. Therefore, take appropriate precautions. The entire synthesis procedure must be performed in a well-ventilated fume hood. NOTE: The details of the instruments, the chemicals, and the materials involved in the synthesis of the MOF films are listed in Table 1. NOTE: For the synthesis of ZIF-8 film, zinc nitrate hexahydrate [Zn(NO3)2.6H2O] is used as the metal salt and 2-methylimidazole (HmIm) is used as the linker. For the metal salt solution, dissolve 2.75 g of Zn(NO3)2.6H2O in 500 mL of water. For the linker solution, dissolve 56.75 g of HmIm in 500 mL of water and stir it continuously until a clear solution is obtained. Cut a high purity copper foil (with 99.9% purity, 127 µm-thick) into 4 x 4 cm pieces. For the ease of clamping the cut foil to a set of Cu crocodile clips, draw a line at a distance of 0.5 cm from one of the edges of the square foil. Flatten the foil using a cylindrical roller on a clean surface. Clean the copper foils thoroughly by bath sonication in acetone for 15 min, followed by bath sonication in isopropanol for 15 min. Dry the copper foils in a clean atmosphere. NOTE: Chose an appropriate substrate to deposit the MOF film. The method can be applied to AAO (Anodisc, 13 mm-diameter hosting pores with a pore diameter of 0.1 µm), polyacrylonitrile (PAN, molecular weight cut-off: 100 kDa), Cu foil (99.9% purity, 25 µm-thick), a chemical-vapor-deposition-based graphene film resting on a Cu foil11, and a homemade nanoporous carbon film resting on Cu foil12,13,14. Carefully position the desired substrate on the center of the Cu electrode using a tape. Rinse the substrate/electrode assembly with water, followed by isopropanol, and again with water for about 1 min. Attach a bare Cu electrode (4 x 4 cm) to the anode. Then attach the substrate/electrode assembly to the cathode. Adjust the separation between the two electrodes to 1 cm inside a 100 mL glass beaker. Mix 31.6 g of the metal precursor solution and 35 g of the ligand solution in a 100 mL beaker and stir it for 30 s at room temperature to form the precursor sol. NOTE: The induction time of ZIF-8 in these conditions is less than 60 s and, therefore, the EPD has to be carried out without delay. Transfer the precursor sol to the vessel hosting the electrodes. Immerse both the electrodes up to the 3.5 cm mark on the electrodes. NOTE: From our experiments, we have observed that applying the electric field before 3 min of sol aging leads to the penetration of the smaller ZIF-8 nuclei into the pores of porous substrates (AAO in this particular case), which needs to be avoided. Therefore, the electric field is turned on only after 3 min, when the nuclei grow somewhat larger. Carry out the EPD with a deposition voltage of 1 V for 4 min. The current should be in the range of 2.5 - 3.5 mA. At the end of the EPD, lower the beaker slowly. As the adhesion between the freshly deposited nuclei and the substrate is weak, utmost care must be taken while handling the substrate. Transfer the dried substrate to a microscopic glass slide. Use tape to hold the substrate in place. For crystal growth, mix 31.6 g of the metal salt solution and 35 g of the linker solution in a 100 mL beaker. Place the microscopic glass slide along with the substrate vertically in the precursor solution and leave it undisturbed for 10 h at 30 °C. After up to 10 h of crystal growth, rinse the substrate with water for 30 min and dry it in a clean atmosphere. Synthesize the ZIF-7 film on an AAO support by a method similar to the one used for the ZIF-8 film but with the following differences. After mixing 0.82 g of Zn(NO3)2·6H2O in 30 mL of dimethylformamide (DMF) and 0.72 g of benzimidazole in 30 mL of methanol for 3 min, carry out the EPD for 1 min. Synthesize an intergrown ZIF-7 film by immersing the ZIF-7 nuclei film in a precursor sol containing 0.58 g of Zn(NO3)2·6H2O, 0.3 g of benzimidazole, and 30 mL of DMF at 110 °C for 4 h.
After cooling down the solution, wash the ZIF-7/AAO membrane by soaking it in DMF, followed by drying it at 60 °C for 12 h.
For the preparation of a sealant, mix thoroughly an equal proportion of the resin and the hardener and leave the mixture for 1 h.
Place the ZIF-8/support membranes on a 24 mm-wide steel disc with a 5 mm-diameter hole at the center. Apply the epoxy along the edges of the substrate at first and, subsequently, cover the substrate except for the 5 mm-diameter hole at the center. Allow the epoxy to dry overnight. Use a stereo microscope to scan the membrane along with a known reference scale. Use graphical software to calculate the exposed area of the membrane from the scanned image. NOTE: In our experiments, the single-component gas permeation tests were carried out by the Wicke-Kallenbach technique in a homemade permeation cell. The mass flow controllers (MKS) and mass spectrometer used in the permeation set-up were calibrated within a range of 5% error. Mass flow controllers (MFC) regulated the feed and the sweep gas flow rate. Ar is used as the sweep gas which carried the permeate gas to a calibrated mass spectrometer (MS) for a real-time analysis of the permeate concentration. Place the steel disc with the membrane in the stainless-steel permeation cell. Ensure a leak-tight fit by placing Viton O-rings above and below the steel disc and fasten the screws. To remove the adsorbed water during the synthesis, dry the membranes at 130 °C under an H2/Ar atmosphere until a steady H2 permeance is reached. Place the set-up inside the oven and set the temperature to 130 °C. Ensure the feed and the sweep lines are preheated. Set the gas flow rates on the feed and the sweep sides to 30 mL/min. Maintain a pressure of 0.1 MPa at the feed and the sweep side by adjusting the needle valves on the retentate and the permeate side, respectively. Calculate the permeance once a steady state is established. Slowly cool down the oven (in about 2 h) to 30 °C and record the values again once a steady state is established. A homemade EPD set-up was used to synthesize the MOF films (Figure 1). Scanning electron microscopy (SEM) images and X-ray diffraction (XRD) patterns were collected for the ZIF-8 nuclei film (Figure 2). SEM was used to image the surface and cross-sectional morphologies of the AAO support, ZIF-8/AAO membrane, PAN support, ZIF-8/PAN membrane, ZIF-8/graphene film, and ZIF-7/AAO membrane (Figure 3). The gas permeance of the ZIF-8 membranes was measured in a temperature-controlled membrane module (Figure 4). The obtained gas separation performance of ZIF-8/AAO and ZIF-8/PAN membranes is shown in Figure 5. The SEM images were used to understand the morphologies of the nuclei films or the MOF films. XRD patterns were used to determine the crystallinity of the nuclei film. Gas permeance data were used to analyze the transport properties of the MOF membranes. The compact nuclei film demonstrates that the ENACT method is quite efficient in controlling the heterogeneous nucleation density over a substrate. Post-growth, the film morphology observed by SEM is compact and pinhole-free and appears to be highly intergrown. The gas permeance data show that the H2/C3H8 selectivity is higher than 1,000, proving that the MOF film is nearly defect-free. Figure 1: The EPD set-up. (a) An AAO substrate is attached to a Cu electrode by two strips of tape. (b) A parallel assembly of the cathode and the anode is connected to a power source. (c) The parallel electrodes are immersed in a precursor sol. Please click here to view a larger version of this figure. Figure 2: SEM images and XRD patterns of the ZIF-8 nuclei film. The first two panels show (a) an SEM top-view image of the ZIF-8 nuclei film on the AAO support and (b) the corresponding cross-sectional morphology. (c) This panel shows XRD patterns of the nuclei film (red) and of the simulated crystals (black). These characterizations demonstrate that the ZIF-8 nuclei film is compact, ultrathin, and crystalline. This figure is reproduced from He et al.10 with permission. Copyright Wiley-VCH Verlag GmbH & Co. KGaA. Please click here to view a larger version of this figure. Figure 3: Surface/cross-sectional morphologies. These panels show surface images and cross-sectional morphologies of (a) the AAO support, (b and c) the ZIF-8/AAO membrane, (d) the PAN support, and (e and f) the ZIF-8/PAN membrane. These characterizations demonstrate that the ZIF-8 films on the AAO and PAN support are highly intergrown and ultrathin. This figure is reproduced from He et al.10 with permission. Copyright Wiley-VCH Verlag GmbH & Co. KGaA. Please click here to view a larger version of this figure. Figure 4: The membrane module for the gas permeance measurement. The ZIF-8 membranes are sealed inside this module. Please click here to view a larger version of this figure. Figure 5: The obtained gas separation performance of ZIF-8/AAO and ZIF-8/PAN membranes. The first two panels show the gas permeance as a function of the kinetic diameter for (a) a ZIF-8/AAO and (b) a ZIF-8/PAN membrane at 25 °C and 0.1 MPa. The other two panels show the ideal selectivity as a function of the kinetic diameter for (c) the ZIF-8/AAO and (d) the ZIF-8/PAN membrane. These figures show the excellent gas separation performance of the ZIF-8 membranes, indicating that the ZIF-8 membranes are nearly defect-free. This figure is reproduced from He et al.10 with permission. Copyright Wiley-VCH Verlag GmbH & Co. KGaA. Please click here to view a larger version of this figure. The standout feature of the ENACT method with respect to the existing methods15 is that the ENACT method enables the synthesis of highly intergrown, ultrathin MOF films on a wide range of porous and nonporous substrates. Any substrate pretreatment is avoided, making this method quite straightforward for the synthesis of MOF films. Although EPD equipment has to be used for the deposition of a nuclei film, the equipment is composed of a power source, a metal electrode, and a beaker, which is quite simple and accessible. We believe that this facile ENACT method can be extended to the synthesis of a wide range of crystalline films. The ENACT process is simple to implement as the preparation protocol is relatively straightforward. This is especially true for a group of crystals that display fast growth kinetics even at room temperature, such as MOFs. The entire synthesis process can be broken down into 3 overall steps: i) setting up the electrode assembly in a precursor sol, ii) turning on the electric field at a precalculated onset time (depending on the size of the nuclei) for a desired period of time to deposit the nuclei film, and iii) soaking the nuclei film in the precursor sol for growth and subsequent intergrowth. This process can be adapted for a range of crystalline materials. The only prerequisite is the knowledge of the induction time, the size, the nuclei density, and the zeta potential. This information can be obtained by characterizing the morphology and crystallinity of the nuclei from the growth gel by TEM and electron diffraction and measuring the zeta potential. For the successful synthesis of high-quality MOF films, there are three critical considerations. (i) The electrophoretic deposition should be carried out only after the induction time. For this, it is necessary to analyze the evolution of the nuclei in the precursor sol by spectroscopic or diffraction or microscopic techniques. (ii) The electrophoretic deposition of the nuclei is a critical step. In this step, the choice of voltage and deposition time should be carefully made. A voltage that is too high or a deposition time that is too long could lead to the deposition of a thick nuclei film, and the subsequent growth into a thick MOF film decreases the overall performance of the membrane. On the other hand, a small voltage will lead to a small electric field and may lead to poor-quality film. (iii) In the crystal growth step, the growth time should be sufficiently long to ensure that the resulting MOF film is highly intergrown. If the nutrients in the precursor sol are depleted before a highly intergrown film is obtained, a fresh precursor sol can be used. Figure 1a shows a substrate bonded to the Cu electrode (cathode). Figure 1b illustrates the parallel assembly of the cathode and the anode connected to a power source. The electrodes are immersed in a precursor gel for the synthesis of the MOF film (Figure 1c). After 4 min of EPD of the nuclei, a compact, 100 nm-thick ZIF-8 nuclei film is formed on the AAO support, as shown in Figures 2a and 2b. The film is comprised of ZIF-8 nuclei with an average size of around 40 nm. An XRD of the film (Figure 1c) verifies that the nuclei film is made of ZIF-8 crystals. A compact, highly intergrown ZIF-8 film with a thickness of 500 nm is generated on the AAO support after leaving the nuclei film in the synthesis sol for 10 h (Figures 3a - 3c). A thinner ZIF-8 film (360 nm) is generated on the porous PAN support (Figures 3d - 3f). The different film thicknesses can be attributed to a slightly different heterogeneous nucleation density owing to the differences in the pore size of the AAO and the porous PAN support. The gas permeance of the ZIF-8 membranes is tested in the membrane module shown in Figure 4. Figure 5 shows the single-gas permeation results for H2, CO2, N2, CH4, C3H6, and C3H8 from ZIF-8/AAO and ZIF-8/PAN membranes. 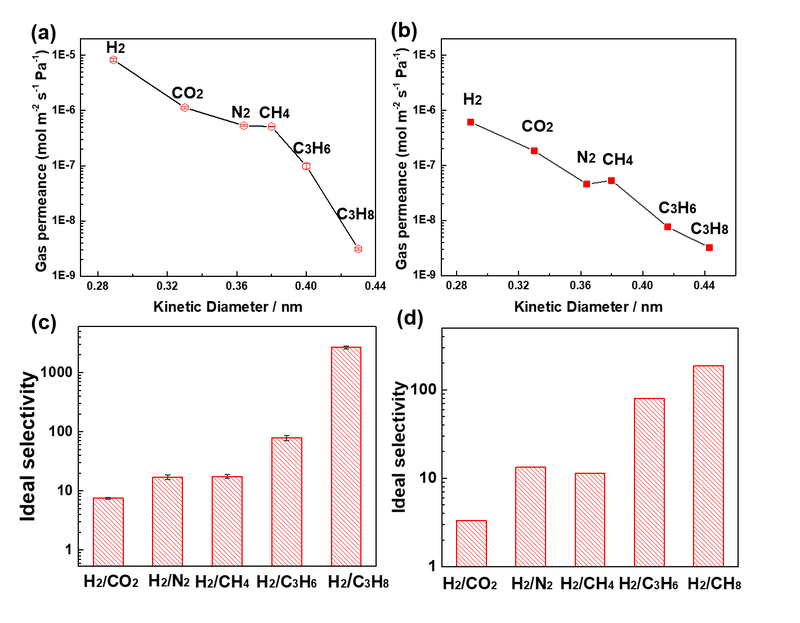 The ZIF-8/AAO membrane shows a considerably high H2 permeance of 8.3 x 10-6 mol m-2 s-1 Pa-1, and the ideal selectivities of H2/CO2, H2/N2, H2/CH4, H2/C3H6, H2/C3H6, and H2/C3H8 are 7.3 ± 0.3, 15.5 ± 1.4, 16.2 ± 1.4, 83.9 ± 7.4, and 2655 ± 131, respectively; much higher than the corresponding Knudsen selectivities. This high separation performance is one of the best among MOF membranes, which is attributed to the ultrathin selective layer (500 nm) and the nearly defect-free feature of the membrane. The ZIF-8/AAO membrane also shows a high C3H6 permeance of 9.9 x 10-8 mol m-2 s-1 Pa-1 with an ideal propylene/propane selectivity of 31.6. The AAO-supported, 500 nm-thick ZIF-8 films show one of the best separation performances for the purification of propylene from propane (a comprehensive comparison with the literature is available in the work by He et al.)10. The ZIF-8/PAN membrane shows an H2 permeance of 6.1 x 10-7 mol m-2 s-1 Pa-1, and the ideal selectivities of H2/CO2, H2/N2, H2/CH4, H2/C3H6, H2/C3H6, and H2/C3H8 are 3.3, 13.3, 11.4, 79.0, and 187. The lower gas permeance from the ZIF-8/PAN membrane is mainly due to the significantly higher gas-transport resistance from the PAN support compared to that from the AAO support9. In summary, we present a reproducible crystallization protocol for MOF films and membranes. The ENACT approach allows researchers to precisely control the heterogeneous nucleation by altering the electric field and deposition time, even from a diluted precursor solution. The film growth can be independently controlled by choosing different growth conditions and, as a result, high-performance membranes can be synthesized. We acknowledge our home institution, the École Polytechnique Fédérale de Lausanne (EPFL), for its generous support. This project has received funding from the European Union's Horizon 2020 Research and innovation program under the Marie Skłodowska-Curie grant agreement No. 665667. The authors thank Pascal Alexander Schouwink for his help with XRD. Knebel, A., et al. Defibrillation of soft porous metal-organic frameworks with electric fields. Science. 358, 347-351 (2017). Brown, A. J., et al. Interfacial microfluidic processing of metal-organic framework hollow fiber membranes. Science. 345, 72-75 (2014). Dzubak, A. L., et al. Ab initio carbon capture in open-site metal-organic frameworks. Nature Chemistry. 4, 810-816 (2012). Gascon, J., Kapteijn, F. Metal-organic framework membranes-high potential, bright future. Angewandte Chemie International Edition. 49, 1530-1532 (2010). Liu, X., Wang, C., Wang, B., Li, K. Novel Organic-Dehydration Membranes Prepared from Zirconium Metal-Organic Frameworks. Advanced Functional Materials. 27, 1-6 (2017). Zhang, F., et al. Hydrogen selective NH2-MIL-53(Al) MOF membranes with high permeability. Advanced Functional Materials. 22, 3583-3590 (2012). Kwon, H. T., Jeong, H. -K. In situ synthesis of thin zeolitic-imidazolate framework ZIF-8 membranes exhibiting exceptionally high propylene/propane separation. Journal of the American Chemical Society. 135, 10763-10768 (2013). Hou, J., Sutrisna, P. D., Zhang, Y., Chen, V. Formation of ultrathin, continuous metal-organic framework membranes on flexible polymer substrates. Angewandte Chemie International Edition. 55, 3947-3951 (2016). Barankova, E., Tan, X., Villalobos, L. F., Litwiller, E., Peinemann, K. V. A metal chelating porous polymeric support: the missing link for a defect-free metal-organic framework composite membrane. Angewandte Chemie International Edition. 56, 2965-2968 (2017). He, G., Dakhchoune, M., Zhao, J., Huang, S., Agrawal, K. V. Electrophoretic Nuclei Assembly for Crystallization of High-Performance Membranes on Unmodified Supports. Advanced Functional Materials. In press (2018). Li, X., et al. Large-area synthesis of high-quality and uniform graphene films on copper foils. Science. 324, 1312-1314 (2009). Rodriguez, A. T., Li, X., Wang, J., Steen, W. A., Fan, H. Facile synthesis of nanostructured carbon through self-assembly between block copolymers and carbohydrates. Advanced Functional Materials. 17, 2710-2716 (2007). Huang, S., et al. 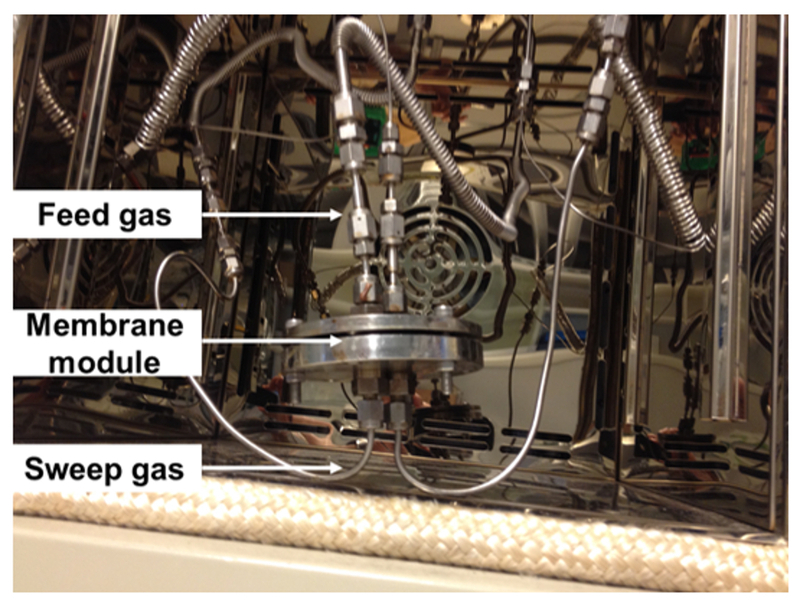 Large-area single-layer graphene membranes by crack-free transfer for gas mixture separation. Nature Communications. Accepted (2018). Agrawal, K. V., Dakachoune, M., Huang, S., He, G., Dudani, N. Ultrahigh flux gas-selective nanoporous carbon membrane and manufacturing method thereof. Patent. Application PCT/EP2017/057684 (2017). Liu, J., Wöll, C. Surface-supported metal-organic framework thin films: fabrication methods, applications, and challenges. Chemical Society Reviews. 46, 5730-5770 (2017).